In preparation of our CCNA exam, we want to make sure we cover the various concepts that we could see on our Cisco CCNA exam. So to assist you, below we will discuss Cisco Switching Cliff Notes. Approximately 20% of your Cisco CCNA exam will be dedicated to Switching. You want to make sure you are well versed in the various terms which will undoubtedly appear on your CCNA exam so you are not caught off guard. Below we will cover the major switching topics you will encounter on your Cisco CCNA exam. Bridges and Cisco switches are devices that segment or break-up collision domains on a network. They are important components of a network infrastructure and function at the access layer and are definately covered on the CCNA exam. Layer 2 switching is hardware based, it uses MAC addresses to filter the network which results in wire speed, low latency and low cost. Bridges are software based while Cisco switches are hardware based. Both use ASCI for filtering decisions. Bridges can have only one spanning tree per bridge while Cisco switches can have many. Bridges can have up to 16 ports; Cisco Switches can have hundreds of ports. Interfaces on the same network monitor the traffic activities and transmit when no traffic is detected. In the event of simultaneous transmissions, a collision will occur. When collision occurs all nodes will wait for a period of time based on a given algorithm before data retransmission. 1. Address learning: Associates every received source MAC address with a local port and builds the CAM table(or MAC Table). 2. Forward/filter decisions: If destination MAC address is in the CAM Table and is associated with a port, it will send it to that port; otherwise the frame will be forwarded to all ports except the receiving port. 3. Loop avoidance: Uses STP to avoid loops. STP is a concept that definately trips people up on their CCNA exam. So take your time in reviewing these concepts. Stops network loops from occurring on layer-2 by shutting down redundant links. STP switches exchange information using Bridged Protocol Data Unit(BPDU) sent over multicast frames. Switches exchange its ID using BPDU. A switch ID is the Bridge Priority (2 byte) followed by the lowest MAC address of any port on the switch(6 byte). All Ports on the root bridge are designated ports, they send and receive traffic(forwarding-state). The port with lowest cost(highest bandwidth) is called the Root Port or designated port, it also sends and receives traffic (forwarding-state). Other ports on the non-root bridge are called Non-designated Ports and will not send or receive traffic(Blocking Mode). Blocking: Won't forward frames; listens to BPDUs. All ports are in this state when the switch is powered up. Listening: Also listens to BPDUs and makes sure it will not create loops. Learning: Learns MAC addresses and Builds the CAM table. Forwarding: Sends and receives data. Store and Forward: the complete frame is received on the switch’s buffer; a CRC is run, and then forwarded to its destination. Fragment Free: Checks the first 64 bytes of a frame for fragmentation before forwarding. This would include the preamble, destination address, source address and length. Cut-through: Once the destination MAC is received (first 13 bytes), the frame is forwarded to its destination. This would include only the preamble and destination address. [dynamic | static] Display the content of the MAC address table. Allows administrators to block unauthorized access to a particular port on a switch. 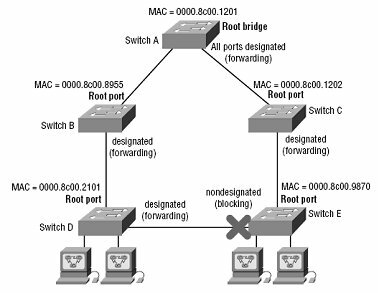 Port security configuration are not allowed on ports which have switch-to-switch connection. switch(config-if)# switchport mode access Define a port as not connected to another switch. switch(config-if)# switchport security Enable switch port security on this interface. switch(config-if)# switchport port-security mac-address mac-address Allow access to this MAC address. switch(config-if)# switchport port-security maximum value Maximum number of authorized MAC addresses (1-132). If an unauthorized node tries to access a secured port, the port will lockup or get disabled. This security feature can be changed by the following command (shutdown is default). If the mac address of an authorized node is not known, the following command will autoconfigure the switch port to authorize the first MAC address to access the port. switch(config-if)# switchport port-security mac-address sticky sw# show port-security interface interface-id Show interface security status. switch# show port-security address Show secured MAC addresses and their associated interface. 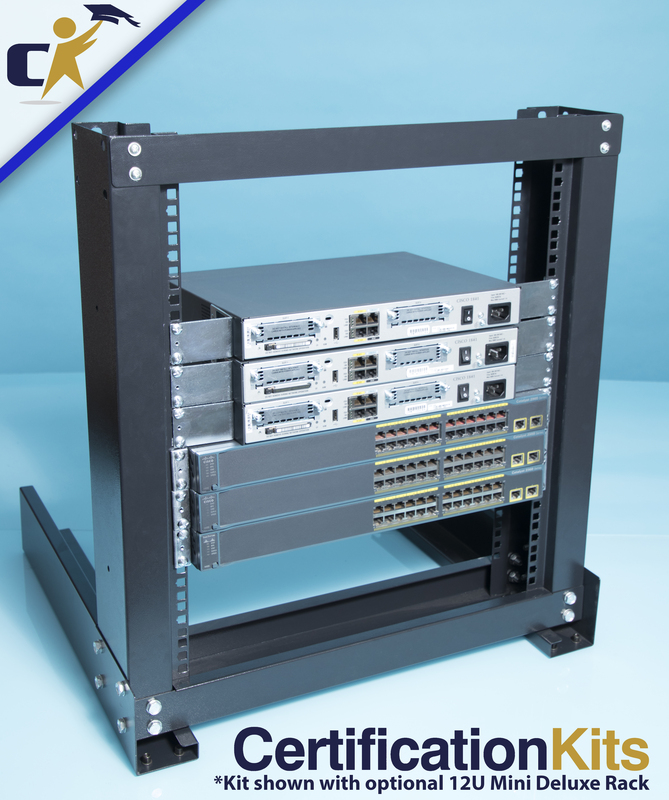 Combines 2 to 8 Ethernet links to provide redundancy in case of port or cable failure. STP looks at EtherChannel as one link, hence, single link failure will not disrupt STP operation. PortFast: allows the switch to immediately put a port into forwarding state when the port becomes active. PortFast configuration can be safely applied to a port which is not connected to a device running STP. For example, if a port is connected to an end user it is okay to turn on PortFast. The Cisco BPDU Guard feature will disable PortFast configuration if the port is accidentally connected to a device running STP. RSTP lowers the 50-sec average convergence time of STP to 1-10 sec. There're 2 variance of Link Type Connection: 1. Link-type Point-to-Point. 2. Link-type Shared. Link-type Shared connection is found in networks which utilizes hubs. There're 2 variance of Edge-type Connection: 1. Edge-type Point-to-Point. 2. Edge-type Shared. RSTP places an edge-type connection into forwarding state immediately when it becomes active, this is similar to the Cisco proprietary PortFast feature. To enable RSTP on an edge-type interface, simply configure PortFast. RSTP reduces the MaxAdge from 20-sec (in STP) to 6-sec (3 “hello” intervals). MaxAdge: the time a root port must wait before starting STP convergence if it no longer receives BPDUs. RSTP reduces the time of learning state by actively communicating new network state. RSTP introduces new port state called Disregarding state and eliminates the listening and disabled states in STP. Ports in disregarding state only listen to BPDUs (same as STP ports in blocking state). 1- Alternate port: If the root port stop receiving BPDU from the root bridge, the alternate port becomes the root port. 2- Backup port: A port in disregarding state connected to the same segment where another port on the same switch is in forwarding state. If the forwarding port link fails, the backup port becomes forwarding port. 3- Disabled port: administratively disabled.